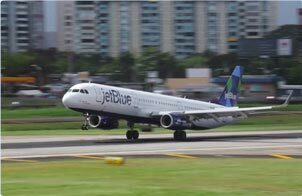 Air101: JetBlue wants regulators to look into the transatlantic joint ventures that stifle genuine competition. JetBlue wants regulators to look into the transatlantic joint ventures that stifle genuine competition. JetBlue wants to expand into long-haul services across the Atlantic, that desire is not new for the low-cost New York based carrier. It had those desires in 2016 and 2017 Indeed, the chief executive of the carrier Robin Hayes has made no secret of his transatlantic aspirations and the new Airbus A321LR might just make that dream a possibility. However, Hayes believes that both the European and US regulators should look again at the so-called joint ventures that exist between some of the big airlines which has lead to groups of carriers sharing revenues, cooperating on schedules and fare prices, which by another name might seem like a legal form of price fixing. “We believe that regulators should be doing everything they can to make it possible for new players and new models to have a fair shot at competing,” Hayes said whilst attending an airline industry event in New York on Thursday, November 15th. He went on to say that the regulators should create an equal marketplace, especially in the wake of the number of airline consolidations that have happened in recent years. American Airlines, British Airways, Iberia with a little help from Finnair have a joint venture which affords them the ability to coordinate on both the fares they charge and when their flights operate to effectively guarantee their combined market dominance is far-reaching. Delta, Virgin Atlantic, KLM - Air France also enjoy all the benefits of a joint venture that ensures they also take a large slice of the market without the risks of trading independently and covers around 300 daily flights between Europe and North America. United Airlines, Air Canada and the Lufthansa Group airlines have a long-running joint venture that covers so many flights, it is really hard to count, perhaps almost as many as 10000 each day! That's a lot of flights, a lot of options where prices are carefully coordinated. Whilst these joint ventures mostly between rich legacy carriers have taken almost all of the Europe - North America market there have been a few outside carriers sneaking in the back door when the big boys weren't looking. Most notable is Norwegian which has managed to carve out a great low-cost niche in the marketplace, others like Primera and Monarch have not been quite so lucky. Even the Icelandic carriers have had to consolidate to continue to operate, at least for the time being, which according to some insiders may not survive until this time next year. Maybe JetBlue has a point, maybe these joint ventures really are having a negative effect on new fresh competition on the transatlantic market, perhaps a few select tweaks here and there could benefit the likes of JetBlue to enter the marketplace with new cost-effective brand new A321LR type of aircraft, with a Minty fresh approach to drive down the business class fares that are quite often on sale at silly money prices.